I usually enjoy dreaming at night about genealogy. I've had some good ones - discovering the family bible, hugging my great-grandfather, and Swedish estate papers morphing into English. But last night's genealogy dream went too far. In the dream, my wife planned a surprise second honeymoon for us. It was just the two of us a luxurious hotel, and a romantic setting. She had also planned a bunch of fun activities. Just as I was relaxing and enjoying the time with her, the dream switched to a library, where me and hundreds of other genealogists were combing through the brand new 1950 U.S. census. I don't think this was one of the activities she planned for us, but if she did, she must really, really love me. Then I woke up. Good thing that in real life I have a wife who loves me and a job I love! Legacy QuickGuidesTM have quickly become one of the more popular resources for genealogists. Each guide contains four (sometimes five, sometimes more) pages of valuable information covering a variety of genealogy research topics, dozens of clickable links, and are written by genealogists and family historians who are experts in the subject areas. We've added two brand new Legacy QuickGuides: Swedish Genealogy by Ralph Kjellgren and West Virginia Genealogy by Peggy Clemens Lauritzen. Now choose from 96 Legacy QuickGuides! To be successful in your West Virginia research, you must first begin with the state of Virginia. West Virginia may be known as the northernmost southern state, or the southernmost northern state. With the land originally belonging to Virginia, heightened feelings during the American Civil War, along with the decision to not secede from the Union separated fifty counties from Virginia. The state of West Virginia was created 20 Jun 1863, and is known as “The Mountain State”, for good reason. Looking to find those elusive Mountain State ancestors? The West Virginia Genealogy Legacy QuickGuide™ contains useful information including a timeline of West Virginia history events, tips on West Virginia research strategy, outline of major migration routes, and more. Also included are links to websites and resources covering vital records, church records, census records, as well as general West Virginia resources. This handy 8-page PDF guide can be used on your computer or mobile device for anytime access. One of our hottest items is available again! It's true at both in-person conferences and online - the Magnabrite Magnifiers sell out quickly. They've been out of stock for quite a while, but we think we have enough of them again to meet your requests. Magnabrite is the original light gathering magnifier since 1950. This highly-crafted 4x magnifier is made of precision machined solid optical quality acrylic. By gathering the available light, the magnifier makes the viewed item 4 times brighter than conventional magnifying glasses. Magnabrite is pre-focused, so it stays in focus at all times. To use, simply glide the Magnabrite over any surface - the focus is automatic and you can view subjects from almost any angle! The slightly concave bottom also reduces scratching to ensure years of use. These Magnabrite Light Gathering Magnifiers are perfect for reading small print, maps, photographs, census records, wills, newspapers, and more! Comes with its own protective drawstring flannel bag. When an attractive wooden base is purchased, the reading magnifier globe fits into a lip in the base so you can move the base with the magnifier globe in it. The base has no bottom so you can view your subject through the globe. 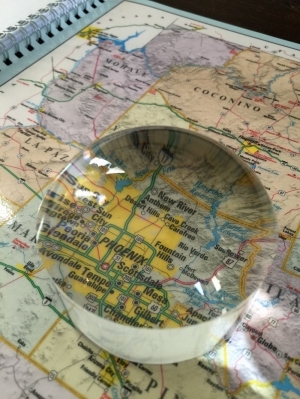 This keeps the magnifier globe smudge free and makes a very attractive desk accessory. Click here to purchase for 25.95. Comes with its own protective drawstring flannel bag. Click here to purchase for $19.95. I have used The Magnabrite for nearly six years and cannot function in my workplace without this. Prior to discovering this, I used a standard hand-held magnifer which was very limiting as I work with price lists and other documents while working on the computer. This allows me the freedom of not having to hold and focus a hand-held device while typing. I am interested in purchasing several and would like to know if these are available only on-line or if living and working very near to your location on W. State St. in Garland I might be able to purchase at your location. Thank you for your time and most of all for your product. S. H.
"I want to thank you for creating the wonderful Magnabrite Magnifier. It has helped me than I ever could have imagined. I can once again, see the dials on my household appliances, read restaurant menus and package labels. It is so convenient, I take it with me for shopping, and enjoy not having to ask for assistance. I can once again read labels. It may not sound like a big thinkg to you -- but it is to me. Thanks again for a wonderful product." -- L. C. C.
I just wanted to take a minute and thank you for the Magnibrite product. I am in my mid 50's and have experienced the inablity to read small print without using reading glasses of some kind. This convenient product has enabled me to at a moments notice, be able to read what I need to at work. I keep it right by my desk so it is always there when I need to use it. I never would have thought it would be so easy to see small type again. This is a great product and so easy to use. I just love my Magnabrite! The recording of today's webinar, "How to Use FamilySearch.org for Beginners" by FamilySearch's Devin Ashby is now available to view for free at www.FamilyTreeWebinars.com. There's a new place for our Danish Legacy Family Tree users to hang out! Join our new Danish Legacy User Group on Facebook today to share ideas, ask questions, or just lurk. Or if you're thinking about using the Dansk edition of Legacy, come hang out in the group and see what others are saying. Click here and then click on the green Join Group button. As it is a closed group (to prevent spam, etc. ), your request to join will be reviewed by our administrators. This shouldn't take long though. Look for the Legacy User Group - Danmark link in your Facebook "GROUPS" panel (it's on the left). Click on it and read what others have written, post a comment, or ask a question. You can also adjust your notifications. Look for this in the upper right. Here's our original Legacy User Group on Facebook. Join the more than 10,400 members there. If Facebook is not yet for you, join our Legacy User Group mailing list here. Or if you have a technical support question, visit our Support Home here. Or if you just want to watch some of our videos, click here. There's also the Virtual Legacy User's Group on Google+ here. Here's our Legacy Facebook page (where we post announcements, etc. ).